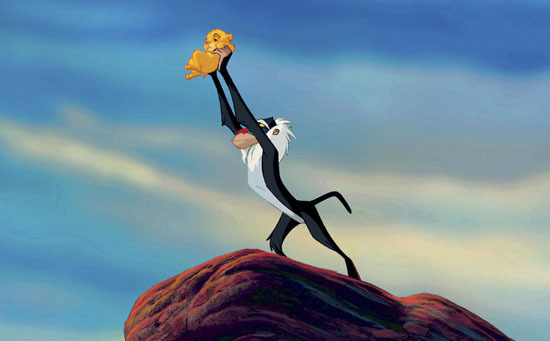 There are two important questions to ask right up front when discussing the new release of Disney’s The Lion King in 3D: how long ago was your last viewing of the picture (in regular 2D, of course), and how many times have you seen in total? These are important to think about, because the answer to those questions may well dictate how you react to the theatrical release of the movie in 3D. I went in to this adventure assuming my task would be to pay close attention to the nature of the 3D itself, since, after all, this isn’t a new release. There would be little point in talking about the movie from the perspective of plot or artistry—probably anyone reading this review has already seen the movie. Dutifully, therefore, I watched for the 3D effects. The verdict is a mixed bag. For me and one other adult, the 3D made very little difference, and we stopped noticing it almost immediately. For us, the movie might as well have been in 2D. Another adult in our party, though, as well as our 8-year-old, were delighted with the 3D effect. That second adult (my wife) called it “like ViewMaster lasting all 90 minutes,” and the 8-year-old felt like it made the hand-drawn animation look much more realistic. After the movie, he jabbered on about things feeling like they existed behind the screen, and this is a kid who sees 3D in the theme parks all the time. My initial guess that this would be about 3D was off the mark though. As I watched the movie, I realized a few things. First, this may well be Disney’s greatest animated feature. It’s got all the big themes – responsibility, family, friendship, betrayal and love. There’s humor used effectively to defuse situations, but not done in a way that distracts. The second thing I realized was that my 4-year-old had never seen this movie, and my 8-year-old didn’t remember it. For them, it was a new movie, period. This was odd, since we own the movie on DVD at home, but then again, we own more than 40 Disney movies on DVD, so clearly we don’t watch all of them often enough. That led to a new thought. Couldn’t Disney return to its old habit of cycling movies back to the theater after a multi-year absence? Previously, films were put on a seven year cycle, but they could easily get away with a longer (20?) year cycle if they wanted to. The movies would find a new audience with each generation. I’m not convinced that 3D would be a necessary draw – the films ought to be entertaining enough on their own – but then again, I’m not the target audience. My 8-year-old is, and he couldn’t have been happier to have seen the movie in all three dimensions. 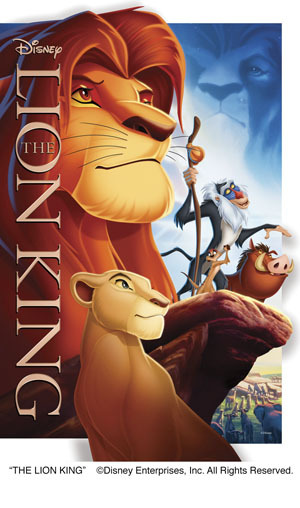 • The 3D version of The Lion King hits theaters on Friday, Sept. 16 for a two-week run. It will then be released in Disney Blu-ray Hi-Def and Blu-ray 3D, and movie download on Tuesday, Oct. 4. My commnets are only in regard to 3D movies. I’ve seen many 3D Movies with my kids and it seems that they limit the eye popping animations to only a couple of scenes per movie if that. Most adults are getting smarter and not going to the 3D vesion since its limited effects for an additonal cost of $3 per person, not worth it. Family of four save $12, use this for the Popcorn and candy.